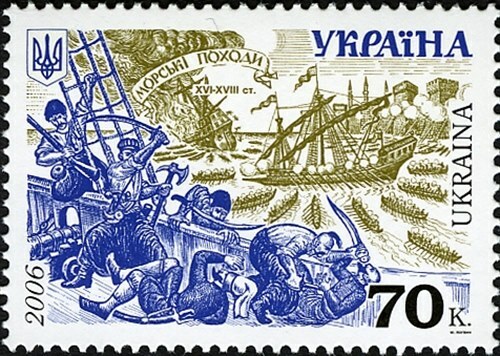 Ukraine issued in 2006 four stamps which shows army/naval history scenes from the 16 - 17th century in the Ukraine, of which two have a maritime theme. 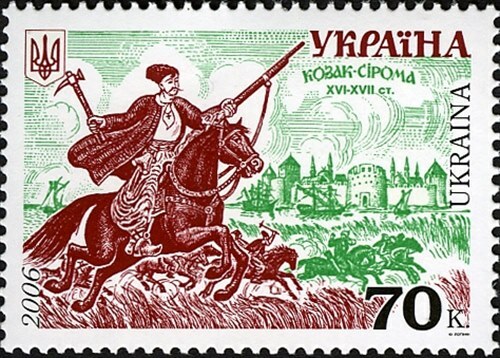 The first stamp shows us a Siroma Cossack (poor Cossack) with in the background some lateen rigged vessels in front of a town. Of the ships I have not any information. The other stamp shows a sea battle between Cossacks and warships of the Ottoman Empire. Where the battle took place I could not find, the Ukrainian Post gives little information by the stamps. The larger vessels are Ottoman galleys, around this galley are many Cossacks in chaika or gulls attacking the larger Ottoman galleys. The ship in the foreground is entered by the Cossacks. Of the chaika or gull is given. The Ukrainian shipbuilding was developed near the Dnipro River, where wood – the main material for shipbuilding at that time was in abundance. It were flat-bottom keelless rowing boats and made of linden and willow wood, while the hulls were made of oak planks. She could be sailed and rowed, a mast was stepped in the amidships, when rowed both sides had 20 – 40 rowers. The chaika could accommodate up to seventy men, and were armed with cannonades. The chaika had the advantage that she were highly manoeuvrable, small and low in the water, difficult to spot. For protection against enemy guns or for sinking, reed bales were tied to the gunwales of the boat. The chaikas had two steering oars one on the bow and one on the stern, by changing course she never had to turn around. Length between 15 – 22 metres, beam 3 – 3.5 metres and depth 4 metres. When needed the Cossack were able to form a fleet of 300 chaikas, and were used around the Black Sea attacking large towns even the suburbs of Constantinople. The Ottoman galley as shown on this stamp of Ukraine, (the larger ships lateen rigged), and surrounded by chaikas was one of the most utilized warships and most destructive one in the Ottoman fleet since its inception was the galley. With a length of 42 – 43 metres between the stern and bow. She were long and narrow fast moving warships. Fitted with three masts and lateen rigged. Five anchors. At the end of the 15th Century each galley carried a big cannon and 4 guns and 8 small guns. The empty store room for the oars was used as a galley (kitchen). When rowed each oar was pulled by 4 or 5 people. Crew: 100 warriors, up to 245 oarsmen and 20 sailors. Source: Ottoman Maritime Arsenals and shipbuilding Technology in the 16th and 17th Century. Ukraine 2006 70K sg?, scott?